An elegant one bedroom,one bathroom apartment set within a quiet residential cul-de-sac , on the South Coast of the isand.This elegantly appointed apartment is finished to a high standard and features twin beds which can be converted to king sized bed if required. Air-conditioned bedroom, modern appliances, ceiling fans, in bedroom and living room. Safe, Flat screen TV; cable TV, CD and DVD players, telephone. Wireless internet. Granite kitchen counter top and marble bathroom counter top. Maid service is offered twice weekly. Towels and linen are provided. It is also a two minutes leisurely walk from, the serene waters and white sandy shores of Accra Beach, the newly built boardwalk on Accra, restaurants, shopping mall, pubs and banks. The famous St. Lawrence Gap renowned for its nightlife and dining and Rockley Country Club 9-hole Golf course are within 5 minutes drive. Elegant boutique one bedroom, one bathroom and studio apartments set within a quiet residential cul de sac in Rockley, Christ Church on the South coast of the Island. These elegantly appointed Apartments are finished to a high standard and features twin beds which can be converted to a king size if required. Air-conditioned bedroom, modern appliances, ceiling fans. Flat screen TV; cable TV, CD and DVD players, telephone. Wireless internet. Granite kitchen counter top and marble bathroom counter top. Maid service is offered twice weekly. Towels and linen are provided. It is also a two minutes leisurely walk from, the serene waters and white sandy shores of Accra Beach, the newly built boardwalk at Accra, restaurants, shopping mall, pubs and banks. The famous St. Lawrence Gap renowned for its nightlife and dining and Rockley Country Club 9-hole Golf course are within 5 minutes drive. The Apartment is located in a quiet cul-de-sac. The living room is air conditioned but this is optional. Wireless internet is also available. wish I could stay here forever. Thank you for taking the time out of you busy schedule. Robert and I are happy that you enjoyed your stay at Cherry Garden Villa. We hope to continue offering our best and we hope to see you again soon. 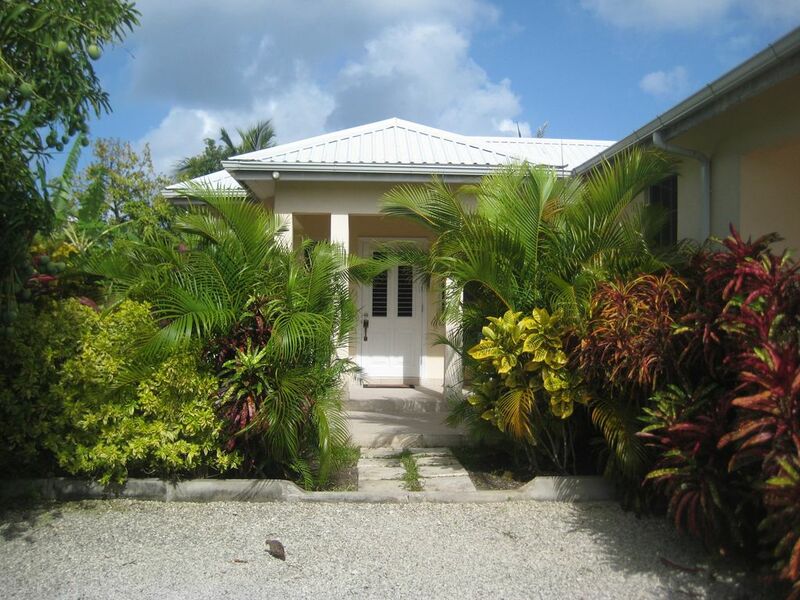 This was our fourth holiday in Barbados but our first in renting private accommodation and it won't be our last, this villa was perfect in every way, as so many other reviews have said. The pictures and reviews on line are what I fell in love with but wow it's so much better in real life. Situated down a quiet residential road only a couple of minutes stroll to the wonderful Accra beach and many local restaurants within walking distance or hop on the local buses to those nearby. There are three villas to choose from all beautifully decorated, spotlessly clean with everything you should need to make your stay as comfortable as possible, including the really large amazing comfortable bed, and situated around a lovely pool and well kept gardens, which the owners Lorna and Robert are so proud off. Robert designed the three different types of accommodation which surround their own property, so they are on hand if needed. After a hard day out at the beach 😉 What more could you ask for than to come back home and sit outside on the veranda and wait for the little green monkeys to scamper across! Amazing and can't wait to return and without a doubt one to recommend. standards. We are happy you enjoyed your vacation and we hope to see you back again. We have just returned from a month's wonderful vacation at Cherry Garden Villa, and the very well equipped one bedroom apartment certainly lived up to the web site description and photos. The pool was an added bonus, and just perfect for cooling off from time to time. This was our second visit to Barbados, and decided we wanted to locate in the Rockley area and would not rent a car. This property turned out to be a perfect little oasis of seclusion and privacy in the midst of an area convenient to banks, shops and restaurants within easy walking distance. Also, Accra Beach and the new boardwalk were only minutes away. Public transportation is also very close at hand. Lorna and Robert were very gracious hosts, and although they are busy professionals they were always available to make sure we were enjoying our stay. Lorna took care of the booking arrangements very efficiently and arranged for a taxi to pick us up at the airport, which was really appreciated. Colleen the housekeeper is an absolute gem and always made sure we had fresh linens and kept our unit in sparkling condition. Thank you Lorna and Robert for sharing your beautiful piece of paradise with us, and we would recommend this property in a heartbeat. We are working on our bucket list of world locations, but will no doubt return. Thank you for your kind words and thank you for choosing Cherry Garden Villa . We look forward to seeing you again and will continue to give excellent service to all our guests. Enjoy your world tour and please come back to beautiful Barbados. We recently returned from a 2 week stay at Cherry Garden Villa. This was our 2nd trip to Barbardos so were quite happy to once again rent a private guest house. Lorna was professional, courteous and was quick to respond to any question we had with the initial booking via email. Arranging the private driver was a nice touch, it was nice to see our name in print when we arrived outside the airport. The pictures do not do the property justice, it is SO clean and just perfect for two people! We rented the one bedroom and it was wonderful. It was a nice touch to have the "in room safe", although we never felt that we needed to lock anything up! The pool was the perfect size for cooling off on the hot days. Having beautiful Accra beach just a minutes walk away was also an added bonus! Remember to bring your own beach towels, this is one thing that I didnt think of (our own fault). There are many local restaurants very close by within walking distance, along with a 24 hour convenience store. The main grocery store Trimark is not that far away, a few minutes by bus or cab. Get out and experience all the Barbados has to offer, transportation is very, very cheap on the mini or big Blue Municipal buses $1.00 U.S. or $2.00 Bajan money. We would definitely recommend this property to our friends and other family and hope to return one day soon. Thank you Lorna and Robert for making our stay everything we anticipated and more! Thank you Michele and Norm for the review. We certainly would like to make our guests feel comfortable and welcomed. We look forward to seeing you in the near future. We have just "reluctantly" returned from our two week vacation in Barbados, staying at the one bedroom apartment at Cherry Garden Villa. Firstly, we have to say "WOW", everything we read about Cherry Garden Villa Apartment, the previous guest reviews, the description of the property on the HomeAway site, electronic communication with Lorna, turned out to be 100% accurate, and some! Although we have visited Barbados in the past, this was the first time we booked our own accommodation, so we were a little unsure what to expect. Would our choice live up to our expectations? The answer quite simply is Yes it did. The accommodation is laid out within beautifully kept gardens, the pool area cool and enticing. Every room was clean, tastefully decorated, bright and spacious. The property is discreetly tucked away from the main road, but is within easy walking distance to both the long sandy Accra Beach, and an abundance of restaurants to suit all budgets. We enjoyed a combination of eating out and cooking within the apartment. The kitchen had everything needed to cook whatever you fancy, local supermarkets nearby to provide your groceries. We would not hesitate to recommend this property to our friends and relatives, as Customer Satisfaction is top of Robert and Lorna's priority list. We will definitely return in the future. Thanks Robert and Lorna for a great stay. We had an absolutely fantastic time staying at this apartment. Lorna kindly arranged a taxi driver to meet us at the arrivals gate which was a nice touch. The accommodation was spotless and had every possible amenity and utensil that you could require. The location was perfect and as described was only 2 or 3 minutes walk away from one of the most beautiful beaches on the island. There are numerous restaurant's, shops and bars within 5-10 minutes walk and we really did believe that the location could not have been better. It is situated so close to everything whilst surprisingly being far enough away to be quiet and private too. We would not hesitate to recommend this accommodation as we genuinely believed that Lorna and Robert have thought of everything and they were wonderful hosts and did everything possible to ensure that we had a perfect stay in Barbados. Thank you for choosing Cherry Garden. It was a pleasure having you both.Robert and I look forward to having you here again soon and hope to make your stay comfortable and memorable. This tastefully appointed apartment is centrally located. It is also two mins walk from famous Accra beach, the newly constructed boardwalk, restaurants, bistros, shopping mall, supermarkets, banks, sports bar, taxi stand, main bus routes to the West and East coasts of Barbados. Also a short drive from the Capital Bridgetown and the Grantley Adams International airport. The Rockley Golf and Country club 9-hole golf course and the famous St. Lawrence Gap renowned for its nightlife, dining, night clubs within 3 to 5 mins drive respectively.The Garrison Savannah, home for horse racing located in the historic Garrison area, surrounded by the National Museum, George Washington House, the Military Barracks are only less than 5 mins drive. Don't forget to visit the Town of Oistins,famous for their Friday night Fish-Fry and entertainment, is less than 10 mins drive from the apartment. A non-refundable deposit of 25% nights is required to secure short term bookings. Payment in full is due 45 days prior to arrival. Purchase of cancellation insurance is recommended to cover unforeseen circumstances. Security/ Damage deposit of $250.00 US is required on arrival. This is refundable on departure after inspection of the unit.